Oldtimers Hockey Challenge a Big Win for Special Olympics Ottawa! The annual Oldtimers Hockey Challenge held in early March drew a great crowd of hockey fans and Special Olympics supporters and athletes. 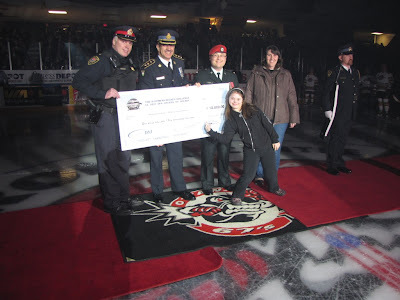 With the help of more than 20 volunteers, the event raised more than $600 for Special Olympics Ottawa. Legendary former NHL players including Theoren Fleury and Igor Kravchuk took on the talented team of players from the local police service in an entertaining game enjoyed by fans and players alike. Please join us in our thanks to the Ontario Law Enforcement Torch Run for organizing this exciting event. Ottawa Council member Christine MacKenzie and Sophie Ann Lacourse-Pudifin joined the opening ceremony the game alongside of officials from the Torch Run, as pictured.